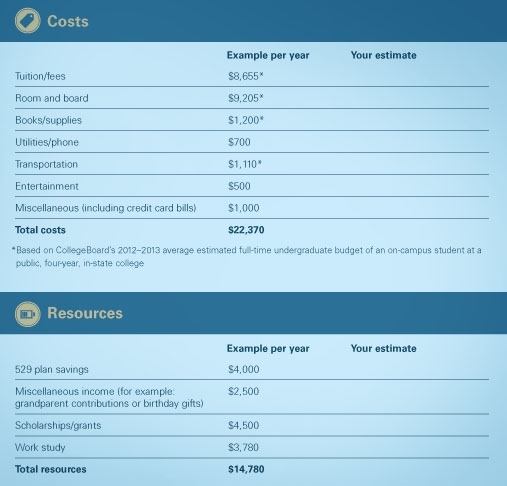 The cost of tuition is a major consideration when it comes to figuring out how much to save for college. But there are other factors you'll need to think about in order to determine how much money's really needed when college begins. As with any type of financial planning, you should start by creating a yearly budget based on your student's potential expenses and your resources and income. Be sure to factor in entertainment, transportation, and other related costs. These often-forgotten items are crucial to helping you form a realistic estimate. Use the sample budget worksheet below to get started. Listed in the example column are approximate figures that'll probably change depending on your student's specific circumstances (i.e., the cost of living in a specific school's town). Remember, not all your expenses can be paid with 529 savings (for example, transportation and entertainment). These additional items don't count as qualified higher-education expenses and will be taxed separately if paid for with 529 assets. You're good to go if you can cover your expenses. If not (like in the example), what's leftover, or your balance, is the amount you'll have to make up through student loans or other sources. You could also try to cut costs or save more. One cost-cutting solution is to send your student to community college for the first year or two. Other ideas include seeking out more affordable housing off campus, buying (or renting) used books instead of new, or cooking meals instead of eating out. Or you can bridge the financial gap by building up your resources. Maybe your student can apply for more scholarships. Or little by little (either monthly or quarterly), you could stash additional savings in your 529 plan account. Another approach is to supplement your savings with your tax refund (if you're expecting one).